Prosecuting Religious Extremists: What’s Going On in Utah? From Chief Prosecutors to Criminal Defendants: Isn’t There a Better Way To Elect Prosecutors? Creighton at a prosecutor training conference in 2007 with co-presenter Kirk Bloodsworth, the first death row inmate in the U.S. exonerated by DNA evidence. A Reluctant Prosecutor is based on personal experiences I had in more than 30 years as a prosecutor in the Salt Lake County District Attorney’s Office and the Utah Attorney General’s Office. The path I followed in my career led me to be involved in a series of high-profile cases, most of them murder cases. They involved defendants who were serial killers, child killers, sexually deviant killers, religious fanatic killers, and mentally deranged killers. While others have written comprehensive books about cases I prosecuted, such as John Krakauer’s Under the Banner of Heaven: A Story of Violent Faith (Doubleday, 2003) and Barbara Oakley’s Cold-Blooded Kindness: Neuroquirks of a Codependent Killer, or Just Give Me a Shot at Loving You, Dear, and Other Reflections on Helping That Hurts (Prometheus Books, 2011), I set out to write a different kind of book –- one that focuses on the things I found most fascinating during my thirty years as a prosecutor. Throughout those years, when I encountered something that fascinated me or that I found particularly meaningful, I jotted down notes and threw them into a file with the thought that one day I might write a book. This book is the result of those experiences. While it’s about bombings, murders, political intrigue, public corruption, religious fanatics, imperious and eccentric judges, capital cases, con men, innocent people convicted of crimes they didn’t commit, overreaching cops, and venal public officials — more than anything else, it’s the story of my personal odyssey through the criminal justice system. 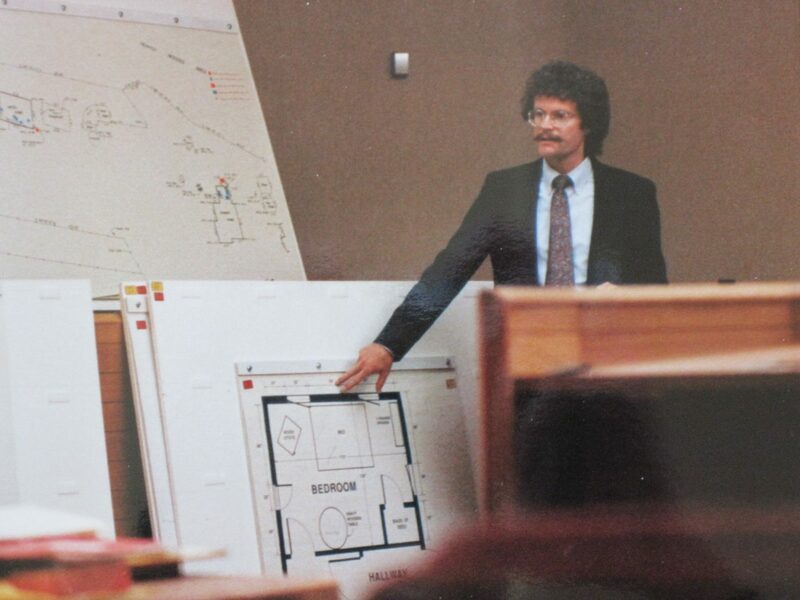 During my years as a prosecutor, I was repeatedly in the right place at the right time to become involved in the most interesting cases of the day. As a result, the book highlights cases which at the time commanded a great deal of press interest and attention, both locally and nationally. When I was assigned my first murder case, it was to assist in the prosecution of Joseph Paul Franklin, an avowed racist and prolific serial killer. A few years later, just as I developed expertise in countering bogus mental defenses, Arthur Gary Bishop confessed to kidnapping, sexually abusing, and killing five young boys over a 4-year period, and I was assigned to rebut his mental defense. Within three months of my joining the Attorney General’s Office, a group of polygamist extremists bombed a Mormon church building and then engaged in a thirteen-day armed standoff with law enforcement officers that culminated in a shootout and the death of an officer. I was assigned the case, which was later made into a TV movie, In the Line of Duty: Siege at Marion (1992). When Ron Lafferty’s capital murder convictions for the brutal slayings of his sister-in-law and her baby were reversed on appeal, I was assigned to re-try the case, which became the subject of Jon Krakauer’s book, Under the Banner of Heaven. I also became involved in major murder cases which I did not personally try. I was picking a jury in a triple capital murder case when notorious serial bomber and master forger Mark Hofmann set off his first bomb in Salt Lake City, so I was not assigned the case, and yet I was the only prosecutor who ever cross-examined Hofmann on the stand. I did not participate in the trials of multiple murderer Ronnie Lee Gardner or serial killer Roberto Arguelles, but when their lawyers raised mental claims in post-conviction proceedings, I was called in to counter those claims. When my colleague Mike Wims retired from the Attorney General’s Office, I stepped in to take his place and assist Pat Nolan and Pat Finlinson in the prosecution of Carole Alden, whose case later became the subject of Barbara Oakley’s book, Cold-Blooded Kindness. I wrote the book for my own satisfaction and enjoyment, without giving too much thought to its marketability, but I have received such enthusiastic feedback from those with whom I have shared the draft that I think the book may have general appeal, even to those who have never heard of the high-profile defendants I prosecuted. The process of selecting the topics to include in this book was simple. I have always loved to write, and I had stories I wanted to tell. Many of the chapters touch on aspects of the high-profile cases I handled which were never publicly reported, and I tell those stories just as I remember them.